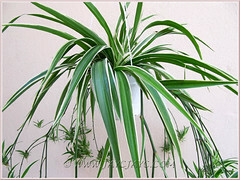 Do you judge Spider Plants to be plain, ordinary and common? Well, we did judge it so until about one and a half years ago when we spotted a few lovely hanging pots of Chlorophytum comosum ‘Variegatum’ at a garden nursery. This very popular cultivar has bright green to bluish green leaves with white margins. They looked so healthy and lustrous. And, encircling beneath the plants were countless baby spiders dancing along the elongated branched stolons… so prolific and eye-catching! We were momentarily flabbergasted… have never seen such a magnificent display before! And of course we did bring home one of those lovely pots of White Spider Plant that day. Just anticipating the great number of plants that can be propagated from the dancing babies or presented as gifts to friends kept us smiling all the way home! We simply dished out a single note of RM10/= to buy it and got more than our money’s worth instead! Isn’t that wonderful? It does show that these common and ordinary-looking Spider Plants can be stunningly beautiful and eye-catching when nurtured with tender loving care! 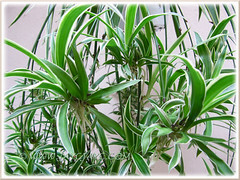 Besides, Chlorophytum comosum or Spider Plant when grown as a house plant, can help purify and refresh our indoor air by filtering toxins and pollutants. 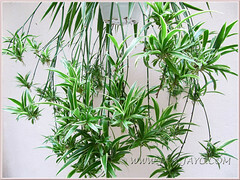 NASA deems the Spider Plant as one of the top 3 plants best for removing formaldehyde. It also removes other harmful chemicals, such as carbon monoxide, xylene and toluene. All the more reason to grow this resilient plant, don’t you think so? 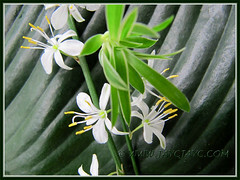 Common Name: White Spider, White-edged Spider Plant, Variegated Spider Ivy, Airplane/Ribbon Plant, Hen-and-chickens. Etymology: The genus name, Chlorophytum, is derived from the Greek word khloros, meaning ‘yellow-green’, and phyton, meaning ‘plant’. The specific epithet comosum is also from the Greek word kome, meaning ‘a tuft of hairs’, referring to the cluster of leaves arranged in a rosette. Chlorophytum comosum was named by Carl Thunberg, known as the father of South African botany, in 1794. Origin: Native to South Africa. It is popularly cultivated worldwide. Plant type: An ornamental, evergreen and herbaceous perennial. Features: Chlorophytum comosum is an attractive species of the genus, Chlorophytum that consists of more than 200 species. The species, Chlorophytum comosum in the wild, has medium to dark-green satiny leaves, but most cultivars are variegated. Variegated leaves come in various shades of green bands with a white, ivory or yellow center stripe, or vice versa. 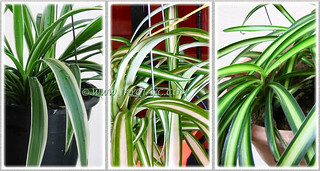 The photo collage below illustrates Chlorophytum comosum in three forms of leaf variegation. From left to right are the cultivars, namely, ‘Variegatum’, ‘Vittatum’ and ‘Streaker’. ‘Variegatum’, the commonest of the white-margined cultivars, has green to bluish green broad leaves with white stripes on the edges and the flowering stems or stolons are green. ‘Vittatum‘ has yellow-green leaves with a broad white central stripe and yellowish-white flowering stalks, while ‘Streaker’ has narrower deep green leaves with a single narrow and bright ivory stripe down the center. More named cultivars here. As with most cultivars of Chlorophytum comosum, ‘Variegatum’ is a vigorous-growing, evergreen clump-forming plant reaching between 30-45 cm (1-1.5 ft ) tall with a spread of up to 60 cm (2 ft). 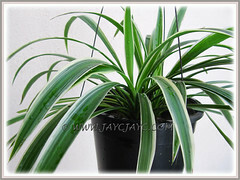 It is one of the most popular houseplants that is grown for its attractive variegated foliage. Its soft and smooth, grass-like recurving leaves that grow from a central rosette are long, slender and tapering, measuring 20-40 cm (8-15 in) long and less than 2.5 cm (1 in) wide. As the Spider Plant matures, it produces branched inflorescence stalks that can be up to 1 m long (3.28 ft) and will gracefully arch downwards. At intervals along the branched stalks a.k.a. stolons, small and inconspicuous, white star-shaped flowers will emerge. Flowers are six-petaled, less than 1.5 cm across and are held on 4-8 mm-long pedicels. At the flowering nodes, baby plantlets are formed, resembling its miniature self, though more spider-like with their cluster of curled leaves and air roots. Hence, aptly known by their common names ‘Spider Plant’ or ‘Airplane Plant’. It has a decumbent rhizome with fleshy and succulent roots that serve as water storage organs for dry seasons. 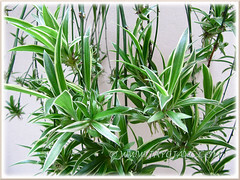 Culture (Care): Chlorophytum comosum ‘Variegatum’ grows easily with minimum care and most ideal for beginners. Light: Prefers bright light, filtered sunlight or partial shade. Can tolerate direct morning sun and moderate warmth, but avoid direct midday and afternoon sun that can scorch its leaves. Nonetheless, plants will lose their variegation in very low light conditions. Moisture: Performs well with regular watering and do allow soil to dry out between waterings. It can tolerate dry conditions but prefers a humid environment. Soil: Well-drained loamy soil though adaptable to any kind of garden or potting soil. Others: Never locate Spider Plants in full sun to avoid scorching of their foliage, while too low light may cause plants to grow spindly, limp and lose their variegation. No pruning required. Simply remove yellow and withered leaves, as well as pinch off brown tips to keep it tidy. Be aware that too little water, too low humidity, too much salts and excess fluorides in the water can cause leaf tips to turn brown. Mist leaves regularly, especially in hot dry climates or place potted houseplants on pebbles in a tray half-filled with water to increase humidity. Preferably water them with rain water or aquarium water. 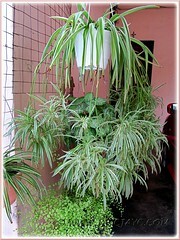 Feed once fortnightly or monthly, depending on its speed of growth, with a liquid houseplant fertilizer. Plants are susceptible to root rot if waterlogged. Generally pest and disease free. For subtropical and temperate regions: Hardiness: USDA Zone 8-11. 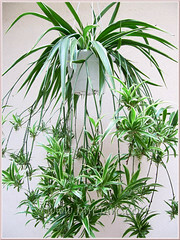 In non-hardy clime, grow Chlorophytum comosum as a houseplant or in a humid greenhouse. Indoors, it thrives equally well at normal room temperatures or in an air-conditioned room. Misting the plants regularly is beneficial to maintain humidity if the air is hot and dry. Water regularly and feed with a liquid houseplant fertilizer once fortnightly when the plant is actively growing during the hot seasons in summer. But water less often and withhold feeding during cool temperatures or in winter. Repot plants in spring if necessary. Spider Plant does not tolerate frost but if killed to the ground in Zone 8, it will quickly revives when warmer temperatures set in. Propagation: Easily propagated by dividing its root mass when repotting. 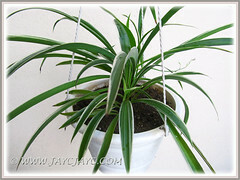 However, the better and easier alternative method is to remove the baby spider plants when roots begin to form and plant them individually in pots or on ground or in water. 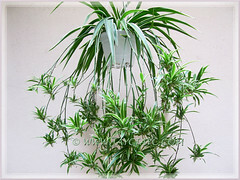 Spider Plants love to be pot bound and by not disturbing the main root mass, they will produce more plantlets to reward you. And, if the parent plant is planted on ground, the plantlets that it produces on elongated stolons take root easily wherever they touch the ground. Chlorophytum can also be propagated from seeds, though rarely done. 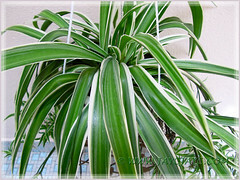 Usage: Chlorophytum comosum ‘Variegatum’ (White Spider Plant) makes an excellent house plant or indoor plant as it’s such an easy-growing and fuss-free plant. 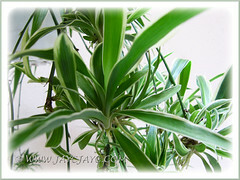 Besides, it has beneficial properties in cleansing the air of pollutants, especially formaldehyde and carbon monoxide. As it tolerates artificial lighting very well and has air purifying abilities, it’s most ideal in office environment where electronic pollutants are emitted. As a decorative plant, Chlorophytum comosum ‘Variegatum’ looks fabulous in hanging pots, especially when the long and arching wiry stems, bearing numerous baby spider plants, cascade over the pots. Great as a groundcover in garden beds/borders as well. Excellent too for container gardening or planter boxes, placed at balconies, window sills or raised on flower stands. Now you have more spidey in your garden!!! Those hanging babies are just look dazzling isn’t it? I have too many of them and they cascade and cover my whole garden hanging space. Thanks, James! The more the healthier as they purify air indoors. You said it… simply dazzling. We gave many of them to church friends who were indeed dazzled when they came visiting.